Fundraiser by Eliza Winnert : We Are Still Here and it's HOT! We Are Still Here and it's HOT! Please help the We Are Here project this summer!! Our grassroots community and learning project in Nea Kavala refugee camp is in urgent need of extra funds in order to finance some upgrades and restock our resources in response to extreme summer temperatures, a huge population increase and the withdrawal of some other organisations and their services from the camp. Over the past 2 weeks, Nea Kavala camp has seen many, many new arrivals. By the end of July the camp will have doubled in size, to about 900 residents. Nearly all the new arrivals are families with young children. This has brought a new, energised and family atmosphere to the camp but it is also stretching resources to a limit at a time when new gaps in services are already being created. It goes without saying that it is also the hottest part of the year. By late morning, the classrooms are already uncomfortable and by the afternoon, the temperatures reach the point where it is extremely difficult to just sit, let alone study. Our Child Friendly Space is now overflowing. It is normally a place for children aged 0-3. 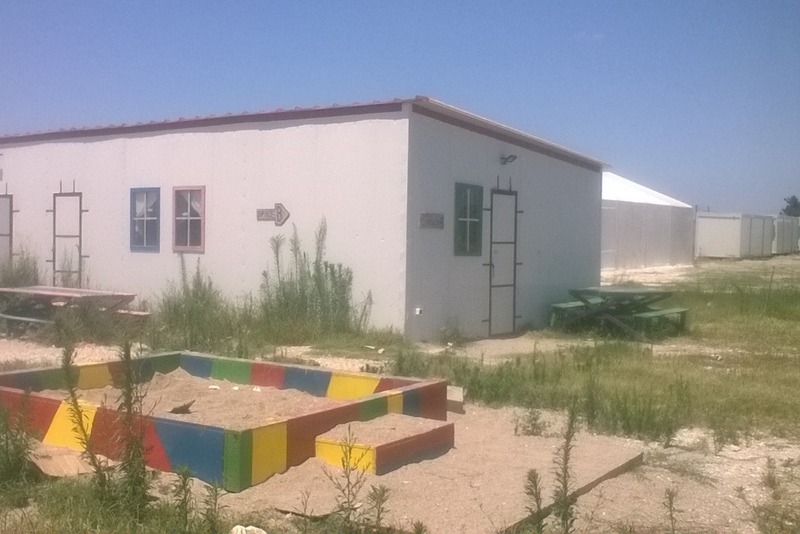 Recently, We Are Here also began welcoming children aged 4-5 for the summer months as the camp kindergarten is closed for the summer holidays. And now we have so many new under 6s signing up each day. We have some creative ideas for how we can expand this play-space, but we lack resources. We also have so many new people signing up for English classes, attending our computer classes, sports activities, music classes, and women’s space activities. - Install an air conditioning unit and two fans in each of the two classrooms and library to improve the learning conditions for our students. - repair old, broken desks and buy new desks and chairs to make room for our many new students. - Buy materials to create temporary extra shaded space around our centre, for both children and adults, and improve and add to the existing areas. - Stock up on teaching supplies – books, pens, paper, board pens, printer ink etc. - Stock up on children’s sports equipment and art supplies to continue our SatARTday and Sunday sports activities with so many more kids! 100% of money received will go directly to paying for these upgrades.